The life cycle of a butterfly is truly amazing. Butterflies have four life stages, the egg, the larva (caterpillar), the pupa (chrysalis), and the adult butterfly. Each of the four stages are very unique to individual species of butterflies which is part of what makes watching and raising butterflies so much fun. The egg stage usually lasts 3-7 days but this can vary quite a bit among different species of butterflies. In fact some species overwinter as eggs and undergo diapause to survive the many months of winter. 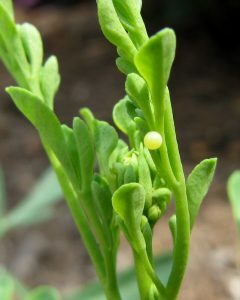 Please visit our article about finding butterfly eggs for more information about butterfly eggs. A very tiny caterpillar hatches from the egg. The first meal for most caterpillars is the eggshell. The caterpillar is designed to be an “eating-machine” and before it begins to pupate it will increase its body mass thousands of times. 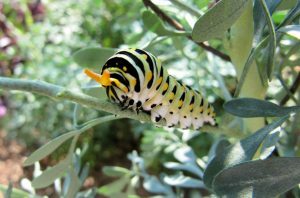 The picture on the left is a small young Black Swallowtail larva while the caterpillar in the picture on the right is an older Black Swallowtail larva. Caterpillars will molt several times as they outgrow their exoskeleton. Each time they do their appearance will change, sometimes rather dramatically. 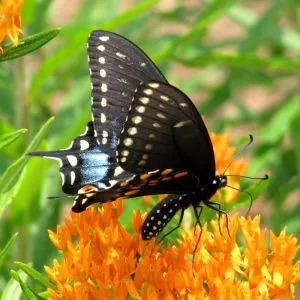 Black Swallowtails, for example, have five instars or five different stages between the hatching from the egg and the time of pupation. The number of instars varies between butterfly species. The caterpillar on the right is in its fifth instar and will soon pupate, or molt, one last time to become a chrysalis. 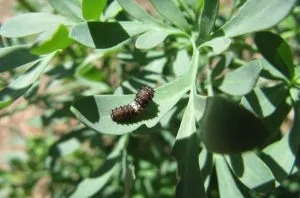 The total time that the butterfly stays in the caterpillar stage is about 2-5 weeks and varies based on the species and the growing conditions. It is believed that the caterpillar stage is the most dangerous in the life cycle of a butterfly as the mortality rates are very high. 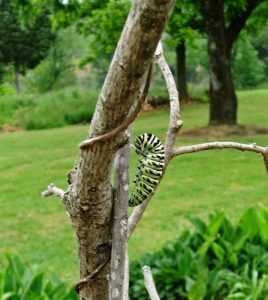 Caterpillars are subject to weather conditions, disease, parasites and predators. Many adult butterfly species lay hundreds of eggs with only a few surviving to become adults. The picture on the left shows a Black Swallowtail caterpillar getting ready to pupate or form a chrysalis. It has made a silk mat and attached itself at the base. The caterpillar also spun a string of silk around its body and attached the strings to the branch to hold the chrysalis in place in the same way that a telephone linesman uses a leather belt to attach to the pole. Not all butterfly species attach in the same way. Actually, the majority of butterflies will hang upside down from their silk pad. The pupal shell is developing underneath the caterpillar’s skin. This shell can take many forms and shapes depending on the species of butterfly. Once the caterpillar is firmly in place the exoskelton will split off exposing the pupa. 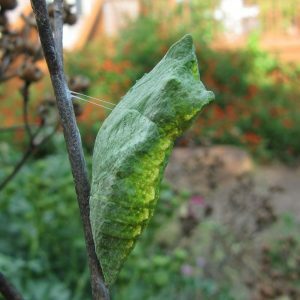 In the case of the Black Swallowtail the final chrysalis will be either green or brown depending on whether the caterpillar is pupating on a green stem or a brown stick. Most butterfly species will stay in the chrysalis for about 1-2 weeks before the butterfly emerges. Several species overwinter as a pupa and will thus enter diapause in the Fall and stay as a pupa until Spring when the butterfly emerges. When a butterfly emerges from a chrysalis its wings are crumpled. The butterfly will hang with its wings down and will begin pumping the wings full of fluids from their body to straighten them out. Then the butterfly must wait several hours for the wings to harden and dry before it can fly away. The lifespan of most adult butterflies is about 2-3 weeks but this can vary greatly among species. Species that over winter as adults (such as Monarchs) will live for many months (this is only true for the last generation Monarchs each summer that is migrating). In their lifespan the female adults butterflies must find a mate and the right plants on which to lay their eggs to begin the butterfly life cycle all over again. Following and exploring the life cycle of a butterfly is a great source of entertainment and education! 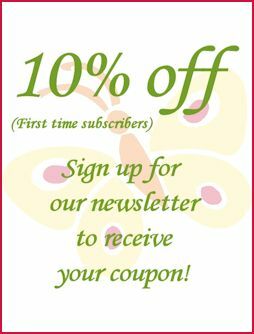 Please spend some time on our website to learn more about attracting and raising these beautiful creatures. 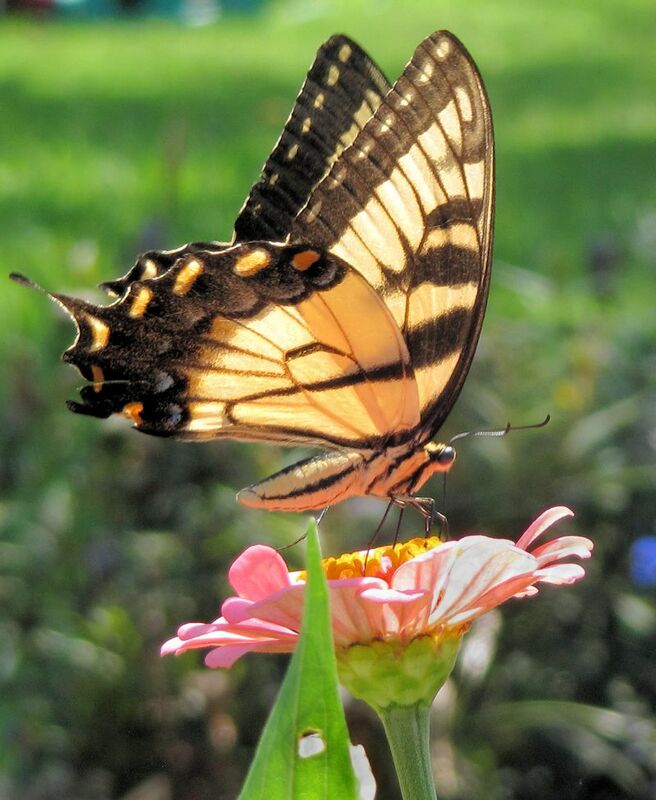 This entry was posted in Butterflies and tagged life cycle of butterfly.